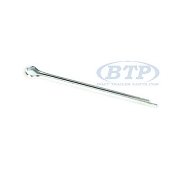 These Roller Shafts are available in Stainless Steel Roller Shafts and Zinc Plated Shafts and will work for nearly any size boat keel roller. We have most in 5/8 inch diameter, which is the more common size for Boat Trailer Keel Rollers. However, we do have some shorter lengths of roller shaft in 1/2 inch diameter. Remember to score the ends of Stainless Steel Roller shafts, roughing them up a bit makes the Pal Nuts grab significantly better for a guaranteed hold. You will notice that the lengths of roller shafts that we carry are directly related to the length of of Keel Roller that you will be using in your assembly. These Pal Nuts are intended for use on Stainless Steel and Zinc Plated Roller Shafts. To installed them, you would use a hammer to pound on the end of the roller shaft. 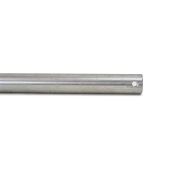 We sell these roller shafts specifically for use with Rollers on Boat Trailers. Therefore, the strength of these Roller shafts is more than capable of handling the weight of your boat.